I am an avid follower of the blog and Greenhorns, as I consider myself to be a fledgling greenhorn. I am currently interning at the Yestermorrow Design/Build School in Vermont, and I think that some of the class offerings here would be really interesting/useful to other greenies. I’m going to be taking many of them, and am really excited. Some of them I’m thinking of are Permaculture Design Certification, Greenhouse Design/Build, Farm Design/Build, Landscape Design, Edible Garden Design, Root Cellar Design/Build…there are a few more that may be relevant to people getting started (or who just want to learn more) as well. The classes here are cool in that they’re taught by people who use the stuff, are pretty reasonably priced with scholarships and work-trade available, and are very hands-on. The school is also about an hour away from Hardwick, the little town that’s gotten some press about how it’s constructing an economy based on a local food system. So it’s kind of a cool field trip. 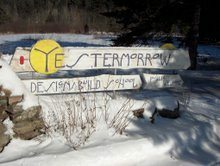 The place: Yestermorrow is a design/build school in Warren, VT that has been in operation for almost 30 years. 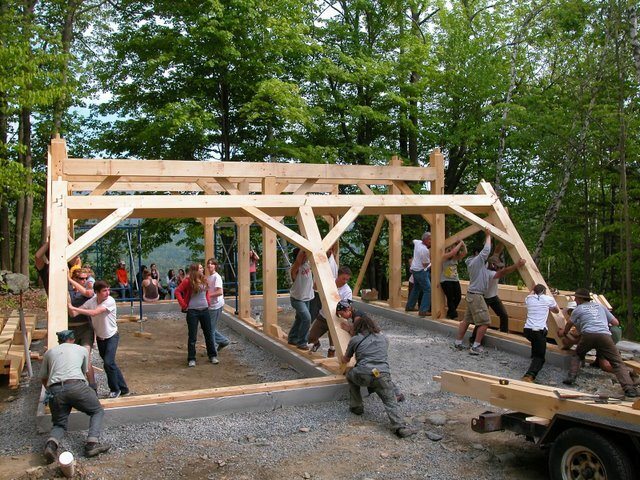 The classes offered teach students sustainable design and building methods and are almost all hands-on. The scope of classes goes from small to large: there are classes on final touches and building single pieces such as cabinetry, mosaics, or concrete countertops. 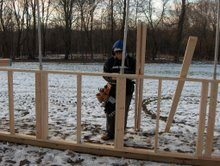 There are classes on building homes like strawbale and cob wall building or timberframing and superinsulation. And then there are classes that focus on building whole communities. Yestermorrow also teaches classes that small farmers, homesteaders or people interested in good food might enjoy. These classes are why I contacted Greenhorns in the first place. The classes I think are most relevant to the blog’s readers are as follows: Permaculture Design Certification, Permaculture for Home and Garden, Ecological Water Systems, Edible Forest Gardens, Greenhouse Design/Build, Landscape Design, Microhydro, Green Roof Design and Installation, Root Cellar Design/Build, Rain Garden Design, and Farm Design/Build. The entire class list can be found online at http://yestermorrow.org/courses.htm and there is also a calendar at http://yestermorrow.org/calendar/feb.htm. There is reasonably priced housing available on campus, from dorm rooms to camping sites with solar showers and composting toilets. A meal plan is also offered here where we get as much food locally as possible. Let me know if you want more about the place. I can give you some links to articles written about Yestermorrow. It’s a pretty magical school, and with the combination of building courses and the home and food courses, I think just about anybody interested in learning how to be a part of the solution to our country and world’s problems would find value in coming here. Oh, and the prices of the classes can also be offset with scholarships and/or work-trade. Classes run anywhere from 1 day to 2 weeks, depending on the class you’re interested in. Some are offered more than once a year. My program: I am one of 6 interns here. The other 5 are design/build interns and are responsible for general maintenance and upkeep, but also do capital improvement building projects. I am the kitchen/garden intern. I am responsible for cooking meals for students, staff, and interns; helping to get more food sourced locally; and the biggest, growing food for the meal plan. We have a main plot that is about 4300 square feet and a smaller area of just over 1000 square feet, with other plots in the works. Our pay is room and board and getting to take classes. that’s it in a small nutshell.